The groups talked about managing the first year of college and found that despite the distance, they have many things in common about housing challenges, fun things to do outside of class and relationships. Whether students are enrolled in classes at RIT in Henrietta or its international campuses in Kosovo or Croatia, many of the same questions arise about negotiating campus living arrangements or mastering the registration system—even the college’s male-to-female ratio. 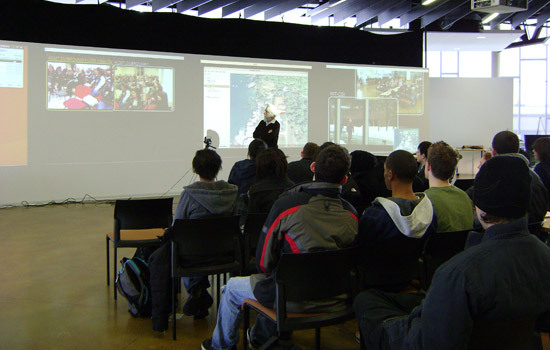 Three classes of First Year Enrichment: Pathways to Service Learning students from RIT campuses in Kosovo, Croatia and Henrietta had the chance to share that important information and bridge the distance between campuses when they met virtually Feb. 1 using the RIT Global Collaboration Grid. 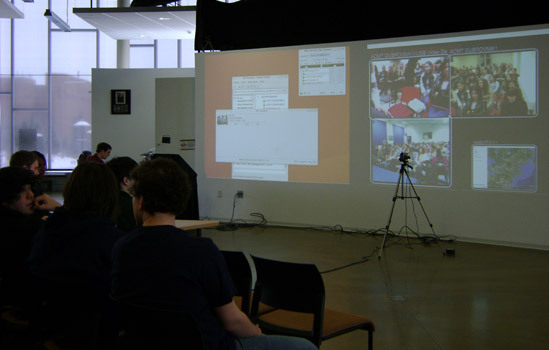 The student-built access grid provided a live, virtual connection to the American College of Management and Technology in Croatia and American University in Kosovo. The students are part of a pilot course focusing on various aspects of service industries in their respective countries. They also had the chance to talk about being the newest kids on the collegiate block and found that surviving the first year of college seems the same regardless of continent. Kyle Abbott asked his peers in Croatia, “Where do you live? On campus or off?” Abbott, a first-year mechanical engineering student from Binghamton, N.Y., learned that his counterparts at ACMT live in apartments near the campus. Many of the students come from the city of Dubrovnik, but also neighboring countries such as Montenegro. “Julia Norrgard and Albina Balidemaj, the American University in Kosovo Pathways instructors, Ana Maria Simundic, ACMT Pathways instructor, and Maureen Barry and I envision the possibility of international campus groups working together virtually on projects,” says Sue Mee, the CAST/Online Learning Librarian in the Wallace Center about the pilot program. Mee helped to organize the program with Gurcharan Khanna, director of RIT Research Computing, and Maureen Barry, FYE faculty for the Pathways sequence. All the students are part of the FYE Pathways to Service Learning coursework, the second in the series of classes for first-year students. The academic program supports the new students as they transition from high school to college and provides opportunities to work with peers from different majors on multi-disciplinary projects and topics. The virtual meetings are expected to continue through the remainder of the winter and spring quarters. The students also have developed a Facebook page to continue conversations.